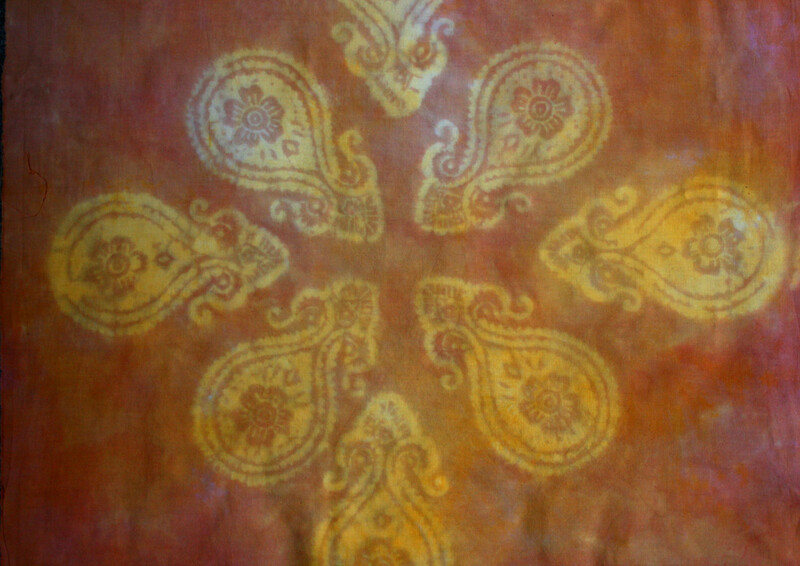 I’m taking an independent studio dye class by Bobbie Vance at the Indianopolis Art Center. We are a small class, just 4 of us and the other 3 are on their second class after having taken monoprint dyeing last semester. So, while they are learning the basics, I’m playing. Bobbie does some beautiful dyeing and I’m glad she decided to do this class before she moves away. She also makes thermofax screens and I just gave her a small stack of graphics from photos I took in Italy and I can’t wait to get playing with those as well! I jumped right in and did some pole, clamp, and stitched shibori. I used corn syrup and mashed potatoes as resists with mixed success. I am also working on some fabric for a fabric shop challenge, but I’ll save that for the next post. I wanted to match a color in a challenge fabric and had a fabulous success on the first shot. Gotta love that! It is only the second time I’ve gone for a particular color and it worked last time as well. I look at either pantones or print colors and the breakdowns of the colors used to make them and use those basic percentages when mixing the dye powders. Hopefully it hasn’t just been beginners luck. Below is a small sample. The wheat print on the left is original. Next is the overdyed shibori pole wrap. 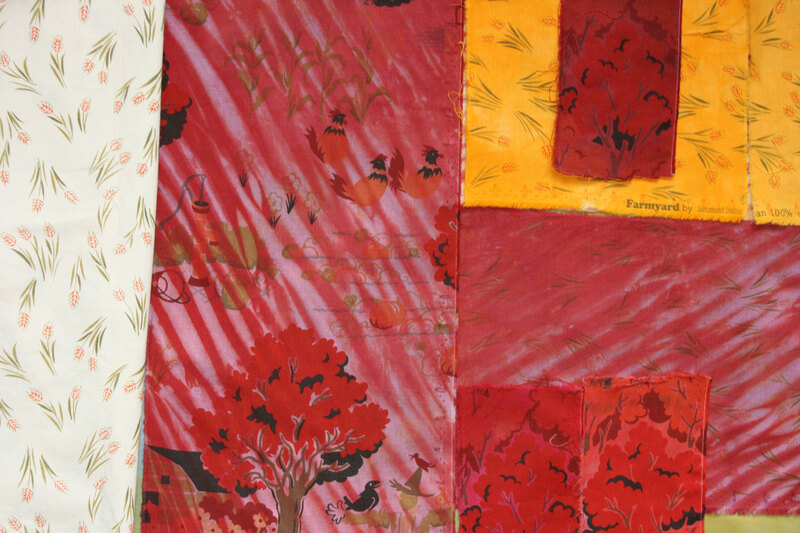 Top right is two test yellows which matched the original golden yellow in the prints and on top of that is the all over tree print that I overdyed with a very very closely matched red. 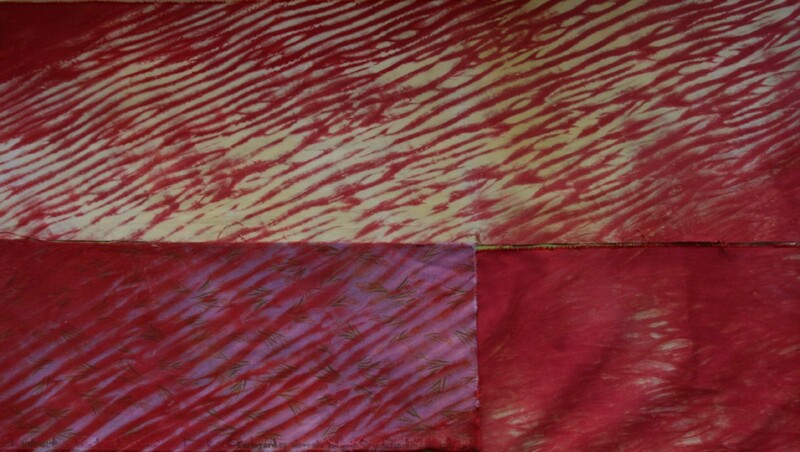 Below right is the wheat print shibori overdyed with test swatches of some premixed dyes which were not quite the right color. 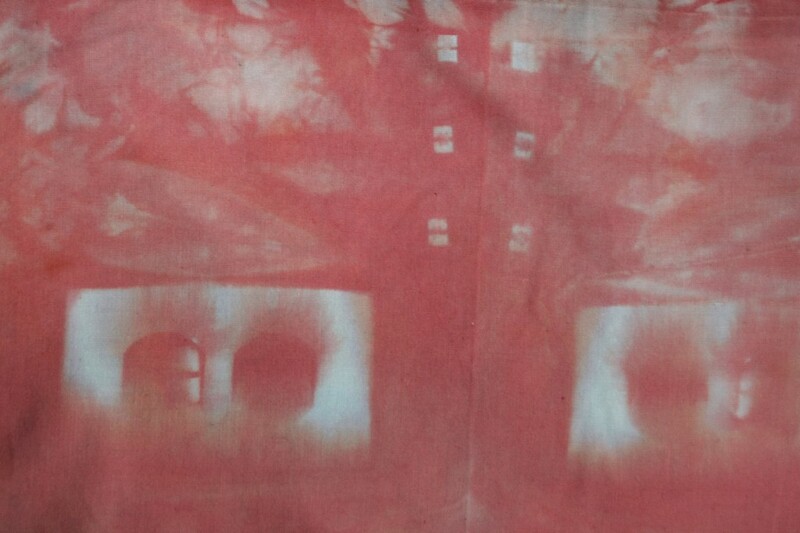 Overdyed Commercial Farm Print Overdyed to Match the Red in the Trees. This entry was posted in Uncategorized and tagged fabric, fiber art, hand dye, overdye, pole wrapped shibori, quilt, resist, shibori, tjap. Bookmark the permalink.